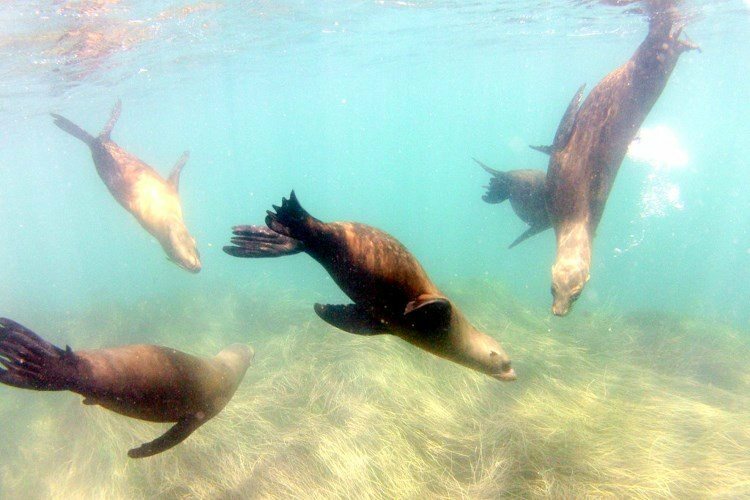 The best snorkeling in San Diego is in the La Jolla Marine Sanctuary. Amazing snorkeling sites such as La Jolla Cove, the Seven Sea Caves, Shores and Marine Room span the area. This 6,000-acre underwater reserve is one of the most biodiverse ecosystems in the world. 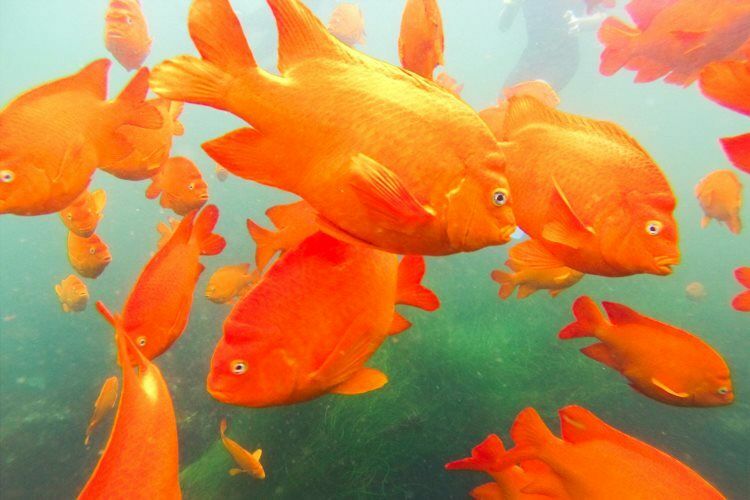 Snorkelers can swim through beautiful schools of fish, including the bright orange Garibaldi. Seals sunbathe on the rocks and frolic in the calm, local waters. Hundreds of California brown pelicans and cormorants dot the towering cliffs. Seasonal visits from pods of migrating whales, sharks and dolphins. Our daily tours in the marine sanctuary explore some of the best spots to snorkel in San Diego. Don’t forget your camera, all these sites in La Jolla are stunning! The best site for snorkeling in San Diego is the La Jolla Cove on the southwest side of the marine reserve. Our tours navigate the protected waters from the Cove all the way to the ancient sea caves. Included with your trip is the complimentary use of mask, snorkel, fins and even a wetsuit. All tours are lead by one of our skilled guides. Following some easy instructions, we grab our gear and jump in. Upon entering the ocean from the small beach at the base of the cliffs, it’s time for fun. Our guides lead all snorkeling groups exploring along the southern sea cliffs. Watch for the baby sea lions swimming in the surf. Get a peek at the spiny lobster or colorful octopus hiding along the rocky reefs. Share the ocean with schools of pretty fish or a little ray. Snorkelers can even check out some of the giant caves. This event is available year-round. Are you brave enough to swim with the sharks? 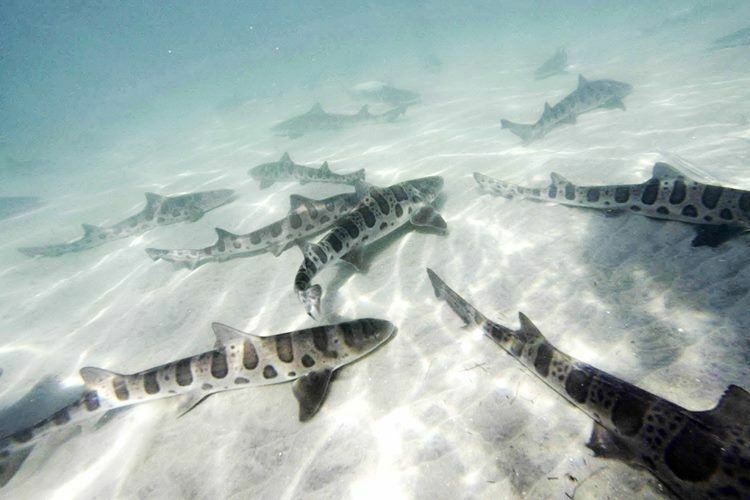 Not to worry, leopard sharks are big, beautiful but considered quite harmless. Each summer thousands of migrating sharks arrive along the La Jolla coast. Most of these leopard print beauties are pregnant. The females use the shallow, protected areas of ocean to give birth and as a nursery. One of the main hotspots is on the east end of the ecological reserve south of La Jolla Shores near the Marine Room. After getting into gear and some quick instructions, our guides will lead you to the action. The species prefer shallow coastal water so are usually easy to see while snorkeling. Shovelnose guitarfish, rays and a variety of colorful fish are also common in this part of San Diego.